Celebrating its 61st anniversary of publication, the Society of Illustrators is pleased to present the premier showcase for illustrators, featuring the most outstanding works created throughout each year. Open to artists worldwide, thousands of entries are considered by a jury of professionals, which include renowned illustrators, art directors and designers. The Library of Congress in Washington, D.C. has officially acquired 6 artworks from Gary Taxali. 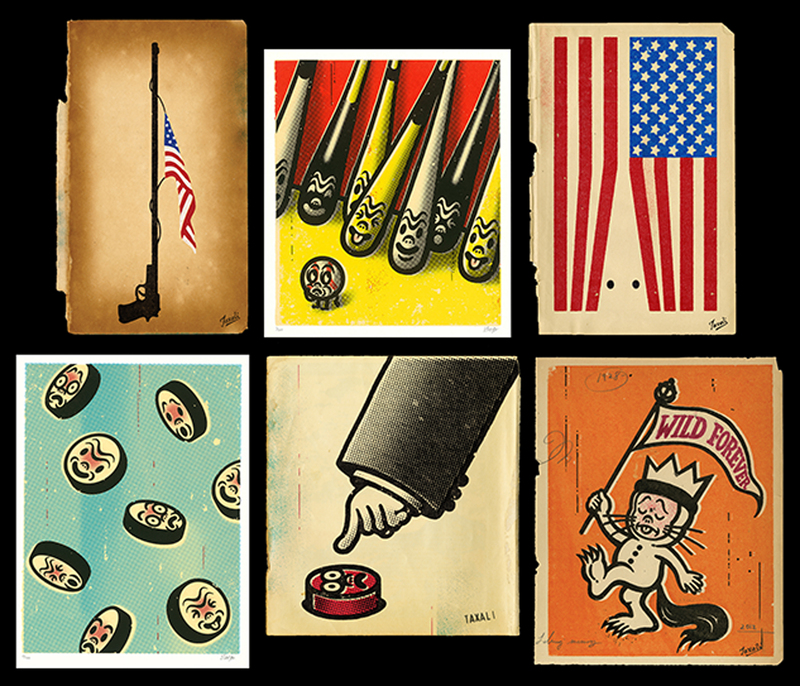 The titles of the works are (from top left, clockwise) "Hypocrisy", "Intimidation", "NO", "Pucks", "Big Button", and "Wild Forever". Read more about Congratulations Gary Taxali! Iguapop Gallery in Barcelona, Spain presents new work by alumnus and OCAD Instructor Gary Taxali. And now for something completely different... we welcome Gary Taxali to the Project Room at Drabinsky Gallery. Drabinsky Gallery is pleased to present a discrete collection of Taxali's distinctive paintings on board, in a show called Originals. Gary Taxali, an artist and professional illustrator, is a graduate of the Ontario College of Art (1991). A fabulously successful illustrator with clients such as Rolling Stone, The New York Times, Esquire, and Bonny Doon Vineyard, Taxali immediately began showing in exhibitions and galleries throughout North America and Europe as well as undertaking to return to his alma mater and assume an Assistant Professor at the renamed Ontario College of Art & Design. DvA Gallery in Chicago toy signing and print launch by Illustration Instructor Gary Taxali. Gary Taxali's work mixes vintage advertising vernacular with contemporary jest, simultaneously poking fun and embracing the sheer absurdness of human nature. Taxali's original long forgotten characters are unearthed and altered through silkscreening, drawing and painting. The end result is an oddly nostalgic presence that evokes a disconcerting wit amongst layers of memory. The show also includes original collaborative art with musician pals Jad Fair, Aimee Mann and Danko Jones. "The work of Gary Taxali takes a basically juvenile bibliophilic impulse - doodling in the leaves of borrowed books - to a more artistically sophisticated level. The books he appropriates aren't the precious kind one sees fashioned into delicate, romantic assemblage works but the thick, hardy sort that fill high school libraries and suffer the consequent abuse. He arranges their covers and pages in grids of varying sizes and embellished these grids with an entertaining cast of cartoonish characters, random words and phrases, and icons of one sort and another. There (sic) is an appealing sense of play, drawn from childhood but supported by a mature iconographic sensibility."